Android TV itself is seeing a bit of resurgence. Not only are more partners hopping on board, but Google claims that more users have joined the fold. Oreo is bringing some changes to the platform, especially when it comes to the home screen. Video previews will play when the app is in focus, e.g. the YouTube suggestion will start rolling like it does on the desktop website. You can check more information in this blog post. For now, let's dive in. Our first entry in this list, Haier is only here because the GE-owned company announced that new devices would be launching in the U.S. later this year with Android TV installed. Google Assistant will come standard, too. We wrote about this a few days ago, so I don't want to rehash what Martim already talked about. Hisense has been rapidly gaining ground in the North America TV market. While the company made several new device announcements, we're obviously only interested in the Android TV stuff: the H10E and H9E Plus series. The H10E is the higher-end of the two, sporting a 4K UHD quantum dot/ULED panel with both Dolby Vision HDR and HDR-10, as well as Motion Rate 480. Not only does it have Bluetooth and Android TV/Assistant, but you also get Alexa compatibility. Hisense says that this product line will go all the way up to 75" screen sizes (not so impressive when you see that the company also announced a 100" 4K laser TV). The H9E Plus also comes in 4K, but with just a ULED panel and Motion Rate 240 (for 55") or 480 (for 65"). The TVs in this line feature a bezel-less design, Android TV, Google Assistant, Alexa, and Bluetooth. Hisense did not specify prices or availability. LAS VEGAS, Jan. 8, 2018 /PRNewswire/ -- Hisense, a global technology leader, today unveiled its innovative 2018 TV line-up, including the breakthrough 100" Hisense 4K Ultra HD Smart Laser TV, an over 1,000-zone H10E 4K Smart ULED™ TV, and the bezel-less H9E Plus 4K Smart ULED™ TV. Hisense continues to transform the TV viewing experience in 2018 with premium technologies like ULED™, Quantum Dot, Dolby Vision™ HDR imaging technology and local dimming, and the next-generation, easy to use Hisense Smart TV platform with new voice control capabilities. After achieving record sales growth in North America in 2017, Hisense continues to transform the viewing experience through its commitment to luxury technologies, larger screen sizes and premium design. Highlighted by the introduction of the Hisense 4K Ultra HD Smart Laser TV, Hisense is continuing to leverage its dedicated R&D teams in Atlanta, GA, San Jose, CA, and Toronto, Canada to meet and exceed consumer expectations for quality and ease of use. "Premium picture and audio quality, seamless access to content, and beautiful aesthetic design remain a priority for consumers this year, and we have set the bar extremely high," says Jerry Liu, Chief Executive Officer of Hisense Americas. "After another breakout year in 2017, we are set to continue that momentum with our incredible line of luxury innovations, including the game-changing Hisense 4K Ultra HD Smart Laser TV." In Q4 of 2017, Hisense introduced the revolutionary Hisense 4K Ultra HD Smart Laser TV, a product that represents the future of premium large-screen home entertainment. Displaying 3,000 lumens (typical) of stunning 4K images on an Ambient Light Rejection screen, the Hisense 4K Laser TV is nothing short of incredible. It also features a four-speaker built-in Harman/Kardon® audio system and wireless subwoofer, which provides a room-filling cinematic audio experience. After receiving extensive acclaim at launch, the 4K Ultra HD Smart Laser TV will be a key product for Hisense in the coming years. Combining ULED™, Quantum Dot, and Dolby Vision HDR, and HDR-10 technology, the 2018 flagship Hisense H10E Series 4K ULED™ Smart TV delivers breathtaking picture quality with over 1,000 backlight zones and a peak brightness of over 2,200 nits (typical). It also features a built-in Android TV interface with Google Assistant and built-in apps to personalize your entertainment. It also works with Amazon Alexa. Awarded over 20 patents, Hisense's ULED™ technology is up to three times brighter than OLED, with better dynamic range and perception of black and white while enhancing color, contrast, black level, brightness and smooth motion. The Hisense H9E Plus Series 4K ULED™ Smart TV matches premium picture quality and elegant design. Combining ULED™, ultra-wide color gamut and Dolby Vision HDR, and HDR-10 technology with a sleek bezel-less design, the Hisense H9E Plus truly is the full package. It features a built-in Android TV interface with Google Assistant, and lots of apps to personalize your entertainment. Press play, pause or turn up the volume, all without lifting a finger. It also works with Amazon Alexa. Premium products like the H9E Plus series are the pinnacle of affordable luxury, with an MSRP starting at under $600. Taking picture quality to the next level, the Hisense H9E Series 4K ULED™ Smart TV brings Wide Color Gamut, HDR-10 from the 50" class all the way up to the 86" class TV. Additionally, the Hisense H8E Series 4K Smart TV is 40 percent slimmer than its 2017 predecessor, with more screen size options than ever before, including 43", 50", 55", and 65" classes of TVs. The next-generation Hisense Smart TV platform will feature a variety of new functions and integrations in 2018, making it even easier for cord cutters to find what they're looking for. The customizable Hisense Smart TV platform makes accessing built-in apps like Netflix, Amazon Video, Pandora, TikiLIVE, YouTube, and others, simple and easy. In addition to offering one-touch access to most of the content consumers want, select 2018 Hisense 4K Smart TVs will also bring voice control to the forefront of the TV viewing experience. Amazon Alexa-enabled Hisense 4K Smart TVs offer a wide variety of voice features right out of the box, including voice commands to turn the TV on and off, change inputs, and volume control. World Cup fans will also have access to special soccer content through the FOX Sports GO: 2018 FIFA World Cup™ Edition, a new app available on the Hisense Smart TV Platform. The Hisense-exclusive app will offer Hisense consumers access to FOX Sports live 2018 FIFA World Cup™ content, 37 customizable viewing angles from the FOX Sports digital feeds, and original soccer content. Nvidia made a special announcement, and probably one of the cooler ones for this post in particular. New at CES 2018 were the Big Format Gaming Displays, or BFGDs — and yes, I do pronounce it the other way in my head. Basically, these are gigantic gaming monitors that have a Shield TV built into them. Coming in at 65", these babies push 4K at 120Hz with G-Sync support. One of the Nvidia reps said that they basically took the chassis off of a Shield TV (2017) and attached it to the monitor (I/O panel and all). Seeing one of these in person was awesome, I won't lie. We got to see both local game and Gamestream demoes. We have no word on how much these will cost, but David and I figure that they'll be several thousand dollars. In addition to this announcement, Nvidia told us about three hardware partners that will kick off the program: Acer, Asus, and HP. We'll likely see these later this year. And I love that Nvidia chose to show off a Hunter with Sunshot in that promo image. LAS VEGAS—CES—Jan. 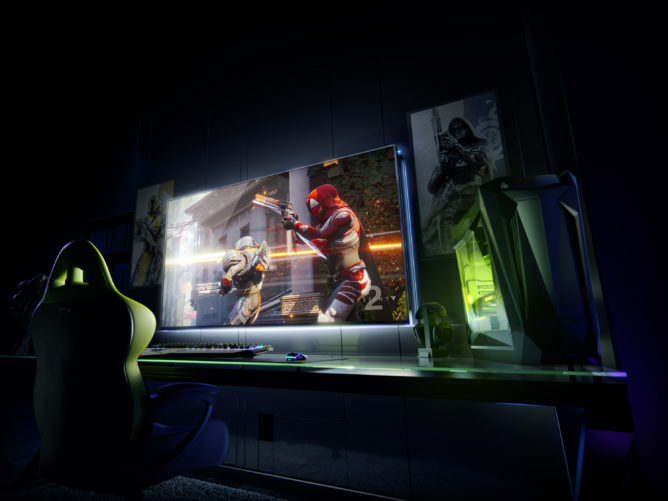 7, 2018—PC gaming today makes the leap to a giant screen, with NVIDIA’s introduction of big format gaming displays, or BFGDs. Created in conjunction with NVIDIA hardware partners Acer, ASUS and HP, BFGDs integrate a high-end 65-inch, 4K 120Hz HDR display with NVIDIA® G-SYNC® technology together with NVIDIA SHIELDTM, the world’s most advanced streaming device. The combination delivers a buttery-smooth gaming experience and your favorite mediastreaming applications — all on a giant screen. Nothing is more important to gamers than responsive gameplay. G-SYNC technology brings the ultra-low latency found in G-SYNC desktop gaming monitors to the BFGD when gaming directly on the PC, AndroidTM, another console or using NVIDIA GameStreamTM technology from a desktop or laptop gaming PC. The integration of the Android TVTM-based SHIELD into BFGDs allows gamers to easily switch between gaming and other forms of entertainment. The bundled SHIELD remote and game controller allow for easy navigation and access to all of the world’s biggest streaming apps, including Netflix, Amazon Video, YouTubeTM and Hulu. BFGDs are available for hands-on demos at CES at the NVIDIA gaming suite and ASUS ROG showcase room at the Wynn Las Vegas by appointment only, and in the HP booth at the Pepcom and Showstoppers press events on Monday and Tuesday evening, respectively. General availability is expected this summer when pricing and further specifications will be announced. LAS VEGAS, Acer today unveils its 65-inch Predator Big Format Gaming Display with NVIDIA® G-SYNC™, introducing big screens to PC gaming. The supersized Predator gaming display builds on the same top-of-the-line specifications that its smaller cousins boast, and integrates NVIDIA SHIELD™ streaming capabilities to play movies and TV shows in stunning 4K HDR. At 65-inches, the Predator Big Format Gaming Display (BFGD) features ultimate gaming specifications that consumers have come to expect from Predator gaming displays. It sports NVIDIA G-SYNC Variable Refresh Rate technology which provides a buttery-smooth, tear-and-stutter-free gaming experience, as well as ultra-low latency at 4K 120Hz. A full-array direct backlight delivers up to 1,000 nits peak luminance, and local dimming provides higher contrast, deeper blacks and brighter whites. The Predator BFGD features integrated NVIDIA SHIELD capabilities, so gamers can easily switch between gaming and other forms of entertainment. A bundled remote and game controller allows easy navigation and access to movies and TV shows from the most popular streaming apps. The entire experience can be controlled by voice, thanks to support for Google Assistant, which also allows smart home control. G-SYNC variable refresh rate technology matches the screen’s refresh rate to the video source’s actual frame rate so video content is presented as directors originally intended it to be seen. I didn't hear about this one until after I got back, but Philips announced a "kitchen-friendly" 24" Android TV that sits on top of a 16W Bluetooth speaker. Since it comes with Assistant, it's theoretically supposed to be a good cooking companion. The mic is always on, and there are two HDMI inputs. I do a lot of cooking, and I keep thinking that I want a Google Home Mini in my kitchen, but this would be equally awesome. We won't know pricing and availability until the latter half of this year. Sony has been a long-standing member of the pre-installed Android TV idea, even going back to the Google TV days. So it's honestly no surprise to see these here, refreshed for 2018. Two new models in particular are worth paying attention to: the A8F and X900F series. The former features a 4K Bravia OLED panel in either 55" or 65", Acoustic Surface technology for better sound distribution, and the X1 Extreme processor to support 4K HDR and Dolby Vision. The minimalist, near bezel-less design is certainly eye-catching. The X900F will be available at up to 85", come equipped with the X1 Extreme for 4K HDR and Dolby Vision, X-Motion to improve motion blur, and X-tended Dynamic Range PRO to offer HDR-like picture quality to non-HDR content. With both of these TV product lines, you also get Assistant and Alexa support. No word on pricing or availability yet, but you can bet that these will be expensive TVs. LAS VEGAS January 8, 2018 – 5pm PT (CES, Booth #17300) – Sony Electronics announced today two new and expanded 4K HDR television series designed to deliver enhanced color, contrast and clarity. The X900F series and A8F BRAVIA OLED series of Sony TVs make the best use of 4K HDR (High Dynamic Range) content and improves SD and HD content to near 4K HDR quality with the combination of their unique picture processor and panel control technologies. In 2017, Sony introduced the A1E, our first large screen BRAVIA OLED 4K HDR TV, offering customers even more premium options when purchasing a TV. The new A8F series builds upon the success of the A1E by incorporating Sony’s unique 4K HDR picture Processor X1™ Extreme and Acoustic Surface™ technology, to provide superior picture quality and awe-inspiring sound. The A8F series features a more traditional TV design with the enriched visual experience of unprecedented black levels, rich colors and wide viewing angles thanks to OLED’s over eight million self-illuminating pixels. The X1 Extreme precisely controls the tremendous number of pixels and extends the capability of OLED to deliver an exquisite 4K HDR picture. Unlike conventional LED where the sound emanates from the bottom or sides, the A8F enables a fusion of image and sound, with voices appearing to come directly from the characters’ mouths and explosions directly from the action on the screen. Together with OLED’s exceptionally wide viewing angle, the A8F series offers unmatched visual and aural experience regardless of the viewing position. In order to meet customer demand for larger screen sizes, Sony is expanding the X900F series. The new premium X900F 4K HDR TV series is available in 85” Class, 75’’ Class, 65’’ Class, 55’’ Class and 49’’ Class. Featured with the X1 Extreme processor, the X900F produces stunning picture quality and provides a wider selection for customers who are looking for bigger, premium 4K HDR TVs. As screen sizes get larger, the industry has struggled to manage blur in fast moving scenes. The X900F series resolves this issue by using a new technology, X-Motion Clarity™, to keep fast action images smooth and life like. The new X-Motion Clarity technology utilizes Sony’s proprietary direct LED panel local dimming algorithm to control the luminance and optimize its duration. Therefore, pictures are clear and smooth with virtually no loss in brightness. Dolby Vision is supported on the A8F and X900F series as well as several 2017 Sony models that were announced last year. Dolby’s deep expertise in bringing advanced technologies from the cinema to the home and on the go, has led to distinct features that enable Dolby Vision to deliver extraordinary viewing experiences to consumers on Sony TVs. To bring your sound to the next level, the X900F series is designed perfectly to match Sony’s new Dolby Atmos® sound bar, the HT-X9000F. The fusion of Dolby Vision and Dolby Atmos transforms your home into an entertainment powerhouse whether experienced via OTT streaming or on 4K UHD Blu-ray disc via your Dolby Vision capable Sony UBP-X700 4K UHD Blu-ray player. To fully integrate into the smart home, Sony’s 2018 Android TVs have Google Assistant built-in, which makes it incredibly easy to discover and access content, as well as control other smart home devices through a Sony TV. The Google Assistant on Sony TV works just by pushing the microphone button on the remote and using your voice to ask a question or say a command. This allows users to seamlessly playback content, search for content, play music, stream photos, control their TV, control their smart home devices and find general information (e.g. weather, directions, fast facts, etc.) all through their Sony TV. Furthermore, Sony’s Android TV works with popular smart speakers such as Sony’s own LF-S50G, Google Home or Amazon Alexa. Pricing and availability of all models to be announced. The X900F and A8F BRAVIA OLED series will be on-sale at Amazon, BestBuy and other authorized dealers nationwide. Sony is exhibiting at the CES Sony Booth # 17300. Stay connected with Sony at events throughout the year. Explore tradeshows and events with our app – wherever you are! Download by searching for “Sony Events” in the App Store or the Google Play Store. To follow the online conversation use #SONYCES. For more information, please visit www.sony.com/ces. 8 million self-illuminating OLED pixels brings a significantly enriched visual experience with unprecedented black, rich color, and a wide viewing angle. Features 4K HDR Processor X1 Extreme providing the ultimate 4K HDR viewing experience by incorporating three new technologies: Object-based HDR remaster, Super Bit Mapping™ 4K HDR and Dual database processing. The minimalist design: A8F series has a clean, minimalist design that keeps you focused on what’s important – the picture. Android TV with Google Assistant built-in: Find what you want quickly, simply by talking. Ask your Google Assistant to help you play TV shows, movies, and more. Dim the lights and control your connected devices while you watch a movie for a better viewing experience. Hands-free control of a Sony TV with Amazon-Alexa-enabled devices and Google Home. Sony’s Android TV works with Amazon Alexa to play, pause, fast forward, and rewind. Google Home allows you to find the entertainment you want without lifting a finger. HDR compatible, including support for Dolby Vision, to receive and process the new video standard signal with higher brightness, higher contrast and more vibrant colors via Internet video services and HDMI. Features 4K HDR Processor X1 Extreme providing the ultimate 4K HDR viewing experience by incorporating three new technologies: Object-based HDR remaster, Super Bit Mapping 4K HDR and Dual database processing. X-tended Dynamic Range PRO 6x. It enhances HDR and non-HDR content by boosting and dimming the backlight levels precisely for each zone of the screen with a unique backlighting technology. (6 times XDR contrast). X-Motion Clarity. It keeps fast action smooth and clear. Moving images are precisely controlled to minimize blur. Even during fast-moving scenes, pictures stay true with no loss in brightness. Designed to perfectly match the HT-X9000F sound bar, complement outstanding pictures with immersive, powerful sound. HDR compatible to receive and process the new video standard signal with higher brightness, higher contrast and more vibrant colors via Internet video services and HDMI. Supports Dolby Vision HDR format. Like Hisense, TCL is another brand that is gaining renown for its TVs. It announced a single Android TV unit, the C6, which will launch with Nougat (Oreo upgrade in the coming months). Based on the PR, it looks like the U.S. is only getting another 4K Roku TV and a Roku Soundbar. The C6, however, features a 4K UHD panel that supports WCG, HDR Pro, and adaptive Micro Dimming. It also sports a Harmon/Kardon soundbar and DTS Premium Sound. 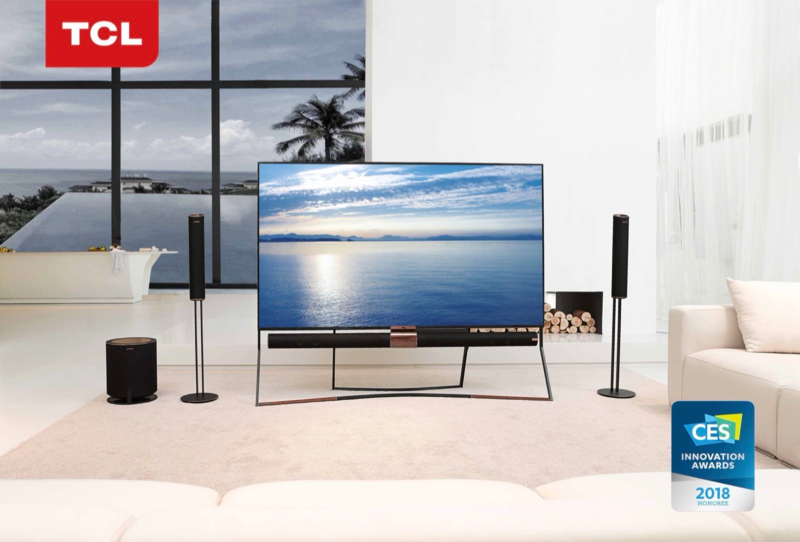 LAS VEGAS--(BUSINESS WIRE)--TCL, top-three global television manufacturer and leading consumer electronics brand, unveiled its 2018 product lineup, including QLED X6, C6 and P5 at CES 2018. The company also announced its latest offerings for the US market, including the 6-Series and 5-Series, and the TCL Roku Smart Soundbar - the first device to be launched under Roku’s new Whole Home Entertainment Licensing Program. TCL also announced five-year, record high global business growth in 2017 and outlined its 2018 business strategy. The 85-inch QLED X6, an Innovation Award Honoree at CES 2018, boasts stunning picture quality and features Dolby Atmos® immersive sound technology. It also comes with a Harman Kardon sound system. The C6 is a UHD smart TV featuring WCG, HDR Pro and Micro Dimming. It features Harman Kardon soundbar and DTS Premium Sound. Powered by Android TV (launching with 7.0 Nougat, upgrade to 8.0 Oreo in the coming months), the C6 offers a range of entertainment options. The P5 is a curved UHD smart TV. The super slim profile and 6.9mm narrow frame are design highlights. The 6-Series will combine 4K HDR picture performance and a powerful stealth metal design for a superior TV experience. The set supports Dolby Vision. The 6-Series comes with a new Roku TV Voice Remote with voice search. The new 5-Series marries superior 4K UHD picture quality with Dolby Vision for a stellar imaging experience. The TCL Roku Smart Soundbar is expected to be launched in late 2018. Westinghouse invokes a bad taste in my mouth. It is not known for quality, instead focusing on providing semi-passable TVs on the cheap. The last couple of years have shown the company to be improving its offerings while keeping the prices low. 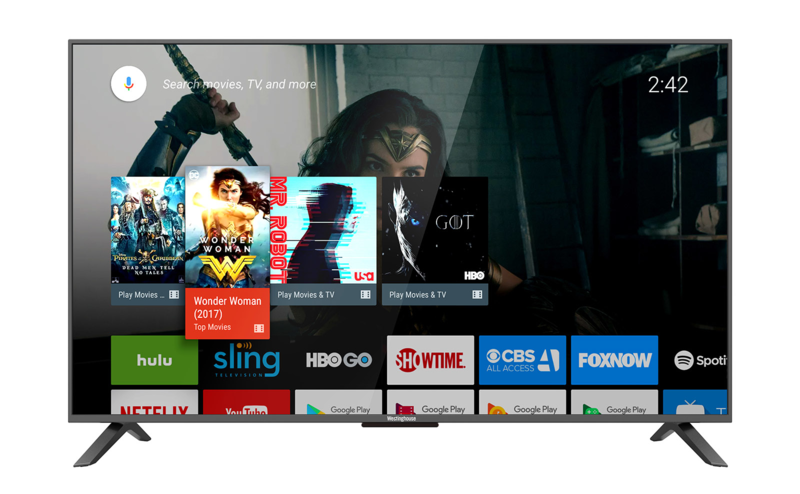 However, at CES 2018, Westinghouse announced a 43" 4K TV with Android TV/Assistant for just $350. Other sizes will be available, but Westinghouse only talked about the 43" pricing. There is no HDR, but it does have a 120Hz refresh rate and built-in WiFi. Finally, we have our honorable mention: Skyworth. I'd never heard of this company before, but I saw its 77" 4K OLED Android TV set. It looked nice, especially with its slim bezels. It seems that the company is not new to the Android TV game, so color me surprised. I'll be keeping an ear out for more information.